Scottish Government constitutional relations secretary Michael Russell MSP and OIC leader James Stockan. Councillors held discussions today with the Scottish Government constitutional relations secretary Michael Russell MSP over the potential impact on Orkney of the Brexit process. 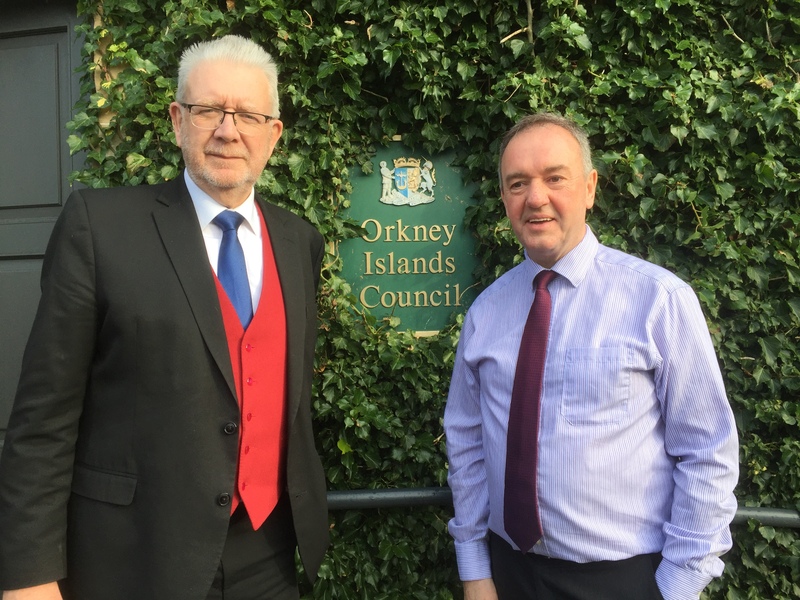 Mr Russell, who is leading the Scottish Government’s Brexit preparations, accepted an invitation from Orkney Islands Council leader James Stockan to visit the county and meet with councillors and senior officials. Following the meeting Councillor Stockan described the talks as “an extremely useful engagement” with Mr Russell. He added: “Everybody got the chance to ask questions today, including some difficult questions, and we had answers that were really worthwhile in an Orkney context.